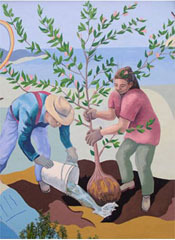 The Arc of San Francisco opened ArtReach Studios in Pacifica, California in February 2004 to provide an art institute experience for 16 adult artists with developmental disabilities living in San Mateo County. ArtReach clients, or students, are assisted to identify and pursue academic majors and minors, to create personal portfolios and websites, and to exhibit their work for sale in public venues. ArtReach is not an art therapy program; it is an arts academy that teaches art history and theory in addition to practice and technique in drawing, painting, photography, printmaking, ceramics, sculpture, website design, film and videomaking, theatre, dance, music theory and composition, writing fiction, plays and poetry, and more. ArtReach students, like all serious artists, research various movements throughout history to be able to identify important painters and styles of painting, poems and poets, photographers, sculptors, architects, film genres, directors, and so forth in order to inform their own artistic endeavors and personal development. In this regard, ArtReach Studios stands out among art programs for people with developmental disabilities. ArtReach is open from 9:30 a.m. to 3:00 p.m. Monday through Friday. Classes are taught three mornings a week by ArtReach Instructors and by guest artist lecturers. Afternoons at ArtReach, students work on their own personal projects and research while receiving individualized guidance, and discuss marketing plans for the exhibition and sale of their work. 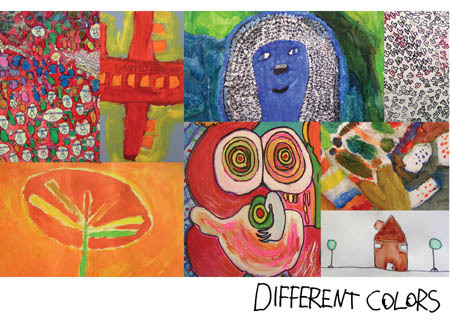 A regular feature of all lessons is facilitated peer critique, in which students are encouraged to speak about their own creations, as well as to exchange ideas with their fellow artists about their unique inspirations and visions, and the expressive process. More than half the time in ArtReach, students learn about art by traveling around the Bay Area exploring museums such as the DeYoung, Legion of Honor, SF MoMA, Asian Art Museum, Yerba Buena Center for the Arts, Fort Mason, San Jose Museum of Art, UC Berkeley Art Museum, and the Stanford Museum of Art, and touring private artists’ studios and workshops, performance spaces, and galleries. ArtReach Instructors also teach students how to find out about and attend events and performances on their own or with friends and family in the evenings and on weekends. ArtReach Studios has been featured in articles in The Pacifica Tribune, and our students are regular visitors to the Pacifica Public Library right next door and the Sanchez Art Center and San Pedro Valley State Park just around the corner. Call (650) 355-5258 today to visit or volunteer!